It is hard to imagine anyone getting through life without a few bouts of back pain. Most of these are little twinges of pain that can be taken care of with over the counter painkillers. A more severe back pain would be when you “throw out your back.” When that happens, it becomes difficult to move without sharp pain. The only way to recover from that is prolonged rest and perhaps a heating pad. Back pain happens when you over exert yourself. This can happen by picking up heavy objects with your back as opposed to your legs. All of this points out the importance of getting help when you need to get rid of heavy objects like furniture or yard debris. The right way for that kind of hauling would be to bring in the pros from Junk King Orlando. 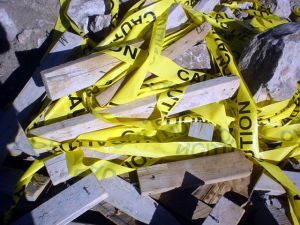 Heavy yard debris can come in many forms from old patio furniture to debris from a torn down deck. You could also have unused pavers, bricks and chunks of concrete. That is a lot of heavy lifting. Instead of putting your back at risk, let Junk King do all the lifting and loading. You’ll be assigned a two-man moving crew who has a lot of experience with this kind of work. They know the proper moving techniques. They use them every day. You might also have some heavy yard debris that is leftover from the last major storm. Junk King can also clear away tree branches, palm fronds and any other natural waste. This is a team that is also able to handle dismantling things in your backyard like a tool shed or swing set. If you want to get rid of something, then just tell Junk King. Weight is a factor with some junk haulers. They like charging by the pound but that’s not going to happen with Junk King. The Junk King pricing policy is based on volume and not weight. How much room your stuff will fill on the back of the truck is how you’ll be charged. That is a very fair and affordable way to handle this type of removal. When you need to get rid of heavy yard debris and the rest of your unwanted rubbish, you can always count on Junk King Orlando to get the job done fast. This entry was posted in Orlando Yard Waste Removal and tagged heavy yard debris, junk king, junk removal on November 28, 2017 by Junk King. Last updated November 28, 2017 .